Service could roll out nationally. 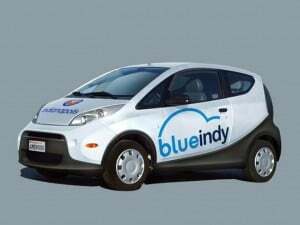 One of the Bluecar electric vehicles that will be offered by the new BlueIndy car-sharing service. Battery-car proponents routinely cite statistics suggesting that most Americans could readily handle their daily chores with an electric vehicle. And a billionaire battery manufacturer from France hopes to prove it with what could soon become America’s largest battery car-sharing program. 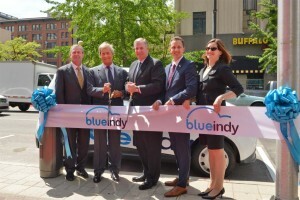 Vincent Bollore, head of the Bollore Group, will invest $35 million to create the new BlueIndy service in Indianapolis using a fleet of specially designed Bluecars developed by the Italian design firm Pininfarina and produced by specialty manufacturer Cecomp. The so-called Bluecars have already been put to service in Paris, as part of the City of Lights’ Autolib car-sharing program. And Bollore is looking for other opportunities to use car-sharing to help promote demand for the batteries his company produces. For its U.S. debut, “We thought it would be good to start with a medium-size” city, explained Bollore, whose company already runs a similar program in Paris. “We want to show the electric car is the best solution for the future. Car-sharing has been gaining traction around the world. In the U.S., membership reached 1 million last year, a 24.1% jump from the prior year, according to research by the Transportation Sustainability Research Center, at the University of California, Berkeley, and that is expected to reach 4.4 million by 2016. The concept not only makes it easier for users – especially those in urban settings — to get vehicles without having to travel to a traditional rental center, but they often are more affordable as they provide the ability to rent for a short period of time, perhaps an hour or two for a run to the grocery store or to pick up something from the local Ikea. Battery-carmakers have been exploring the potential offered by such services to give potential EV buyers a taste of what vehicles such as the Nissan Leaf and BMW i3 are like to drive. The Japanese maker, for example, is working with Georgia-based JuiceCar which is offering the Leaf at a rate of just $5 an hour or $25 a day. JuiceCar also offers the plug-in hybrid Chevrolet Volt for $7 an hour, or $35 a day. ZipCar recently inaugurated a pilot EV car-sharingprogram in Chicago, while Car2Go is operating in San Diego. Bollore’s initial effort, in Paris, has fielded a fleet of 2,200 vehicles with 4,300 charging stations around the city. It claims to have had 120,000 unique users over the last two years, collectively logging 3.5 million rentals and clocking 18 million miles. Bollore claims to have an advantage over other car-sharing services with his custom-designed vehicles. He also is using a lithium-metal-polymer battery produced by his French-based subsidiary, Blue Solutions, which are reportedly less expensive to produce than the lithium-ion packs used by manufacturers such as Nissan or battery-car start-up Tesla Motors. Meanwhile, each Bluecar is equipped with a 50 kilowatt-hour pack, roughly twice the size of the batteries in the Nissan Leaf. That allows a full 150 miles range per charge, almost double that of most of the current battery cars on the market – with the exception of the Tesla Model S.
The BlueIndy project will need about 20,000 subscribers to break even, according to Bollore. Users will pay a start-up fee and then have access to one of its electric vehicles for $10 an hour. In a conference call, Indianapolis Mayor Greg Ballard said he expects the program to have wide appeal to both students and corporate users, the city housing major operations of such firms as Roche Diagnostics and Eli Lilly and Company. The city’s Indianapolis Power & Light will invest another $16 million in chargers, noted the mayor, who added his belief that the project could be in the black within five to seven years. In fact, Bollore’s Parisian venture was profitable in 18 months, rather than the five years initially forecast. “If we can make it work in Indianapolis, we can make it work anywhere in America,” said Paul Mitchell, the CEO of the non-profit Energy Systems Network, which helped plan the BlueIndy project.